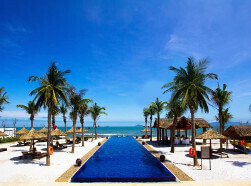 One of the top luxury hotels in Cua Dai area of Hoi An, the Victoria Hoi An Beach Resort & Spa features 109 well-fitted guestrooms with ocean and river views. The rooms are clean, spacious, and offer comfortable beds to make the stay as comfy as possible. The breakfast at the restaurant provides the guests with a variety of dishes for a fulfilling start to the day. The attentive and English speaking staff further adds to the comfort. By staying at this hotel, guests will enjoy services like daytime recreational activities including windsurfing, wakeboarding, diving, table tennis, and tennis. Other convenience facilities include free Wi-Fi across the property, bicycle rental, airport transfer, currency exchange, babysitting services, express check-in/check-out. The resort is only 5 km away from the Hoi An Ancient Town and Cam Thanh Bridge is reachable in 24 min on foot. Guests may find the resort a bit expensive than the rest of the luxury resorts in the same vicinity but its exceptional services and striking location make up for it. With a private beach, the Palm Garden Beach Resort & Spa is another luxury property with 214 modern guestrooms. The resort is a perfect place for couples, families, and business travellers. From convenience services like free area shuttle, airport shuttle, childcare services, free Wi-Fi in rooms and public areas, express check-in/check-out, the resort offers excellent services and facilities for its guests. 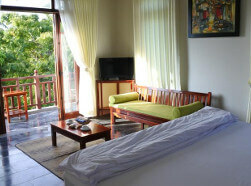 All the rooms are brightly furnished, high on cleanliness and comfort, and offer beautiful garden and sea views. The resort is 23.51 km away from the Da Nang Airport while the Nguyen Tat Thanh Bus Station is 4.51 km away. 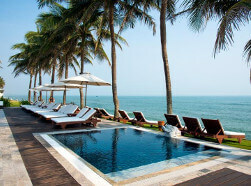 Some of the popular attractions like Quan Cong Temple, Cam Thanh Bridge, and An Bang Beach are within 5 km from the hotel. The staff at the hotel speaks fluent English to communicate easily with the western travellers and is always prompt in helping the guests with exceptional customer service. 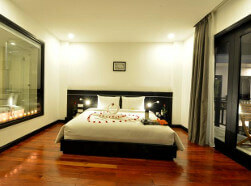 Modern and comfy, the Hoi An River Town Hotel enjoys a beautiful location with excellent staff and facilities. The hotel is clean with modern amenities and the rooms are spacious, clean and offer lovely river views. The hotel is popular for its overly friendly and courteous staff that will only take the experience to the next level. The staff not just speaks English but also Spanish, French, and Portuguese. It features 76 guestrooms, a business center, two outdoor pools, restaurant with free breakfast, garden, and fitness center. Other convenience services include currency exchange, luggage storage, salon, daily housekeeping, free Wi-Fi across the hotel, bicycle rental, free shuttle service, and airport transfer. For families, the hotel provides childcare services and connecting rooms. The hotel is a short 8 to 9 minute walk from Chua Cau and Tan Kay House while the Hoi An Ancient Town is 11 minute walk away. 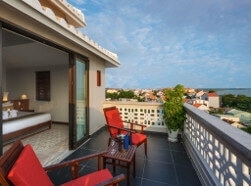 Make the trip to Hoi An memorable and outstanding with the Hoi An Sincerity Hotel and Spa. 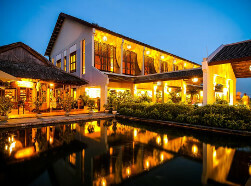 Located at Quang Nam, this hotel is hardly 1.1 kilometers away from the famous Hoi An Historic Museum. 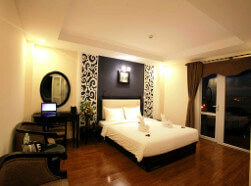 It features 54 beautifully appointed rooms with modern facilities. Some of the common facilities of this hotel include a spacious terrace, a beautiful garden, free parking facility and free access of Wi-Fi throughout the property. Guests can visit the spa center of the hotel to rejuvenate their body and soul. The hotel also features a bar where guests can enjoy their favorite drinks. Da Nang International Airport is almost 22.5 kilometers away from this hotel. Set on the lovely banks of Thanh Nam River amid palm trees, Villa Orchid Garden RiversideS offers fine accommodation facilities to travellers to Hoi An in Vietnam. The hotel fascinates travellers for its peaceful location and contemporary design. It is located almost 24 kilometers drive away from the Da Nang International Airport. The hotel is 1.7 kilometers away from the Assembly Hall of Fujian Chinese Congregation, Assembly Hall of Hainan Chinese Congregation and Assembly Hall of Chaozhou Chinese Congregation. The staff at the front desk helps their guests for planning outdoor activities, shopping and luggage storage. This property offers free Wi-Fi access for their guests. The Riverside Restaurant offers an array of both Vietnamese and international cuisine. It also boasts more than 50 types of international wines of selected countries. Featuring a spa center and an outdoor swimming pool, Venus Hotel and Spa is a beautiful hotel located in Hoi An. It is only 900 meters away from the famous Japanese Covered Bridge. Travellers can reach this hotel from Da Nang International Airport within a 45-minute taxi ride. Danang Train Station is nearly 40-minute drive away. This hotel features 60 aesthetically designed rooms with modern facilities. Besides, it has a 24-hour front desk, gift shops and free Wi-Fi access. The renowned Cantonese Chinese Congregation is 1 kilometer away from this hotel while the Hoi An Ancient Town is 1.2 kilometers away. The area is famous for cycling and bike hire is available at this hotel for their guests to conveniently explore the destination. 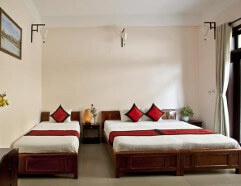 The Village Homestay enjoys a great location with exceptional services and facilities just like any three star hotels. It is 23.11 km away from the Da Nang Airport and Nguyen Tat Thanh Bus Station is located at a distance of 1.41 km. All 6 rooms come with free Wi-Fi with other convenience services offered such as concierge, currency exchange, express check-in/check-out, luggage storage, airport transfer, shuttle service, bicycle and car rental. 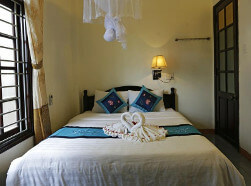 The property provides impeccable services at the low rates, making it one of the preferred budget hotels in Hoi An. The Nguyen Hoang night market is located next to the homestay while the attractions like Assembly Hall of the Cantonese Chinese Congregation and The Japanese Covered Bridge are at a mere distance of 300 m only. A gorgeous villa with eight guestrooms, the Ngan Phu Villa is a cozy and beautiful stay option in the Cua Dai area of Hoi An. The villa is owned by Moon and Quyen who take the experience to the next level with their warm service and friendly nature. 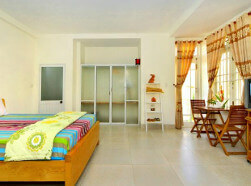 The rooms are clean, beautifully furnished and feature balconies. The ancient town is reachable on foot within 20 minutes but the home stay provides an option for bike rental to get to most of the places faster and conveniently. The few lows at the villa are that it does not provide Wi-Fi at all and the staff only speaks Vietnamese which may be an issue for western guests. For business travellers who would like to stay connected to the world through Wi-Fi may want to go for another budget hotel with better facilities. With three clean and cozy rooms, the Countryside Moon Homestay offers a comfortable residence like ambiance to its guests. The homestay features free Wi-Fi across the rooms and public areas, a shared kitchen, room service, concerige, laundry service and family room for guests with kids. To get around, the homestay offers bicycle rental and car rental to the guests to explore the city at their own pace. Airport transfer is available at a surcharge. The staff here speaks English and is courteous enough to make the stay even more comfy for the guests. 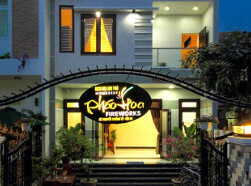 Located in the Cam Pho area, the Fireworks Homestay is a cozy home-like budget accommodation option with 5 rooms having the categories of Deluxe Double Room, Deluxe Double Room with Balcony, and Triple Room with Balcony. The homestay is ideal for single travellers, couples, and families. The hotel provides free Wi-Fi in all rooms and public areas with other convenience services like airport transfer, shuttle service, airport transfer, and car park. Getting spa, massage, room service, currency exchange, luggage storage, express check-in/check-out at low rates makes this hotel a preferred choice amongst travellers. The hotel is high on cleanliness, service, and location as it is in close proximity to Hoi An Historic Museum and Assembly Hall of the Fujian Chinese Congregation. Feel at home away from home with Skybird Homestay, a beautiful stay option located in Cam Chau Ward area of Hoi An. The home comprises 5 rooms with beautiful lush garden, owned by a person named Lac and his wife Chi. The guests here get warm and friendly welcome from the owners who will ensure the experience stays in the hearts forever. From cooking homemade delicious meals to arranging free bikes to explore the town to telling the town’s age old stories and history, staying at the hotel is surely an exceptional experience at a low budget. 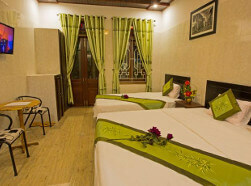 The rooms are large and comfortable with modern bathrooms. It is only 400 m away from Cam Chau Market while the Hoi An Town and Cua Dai Beach are located at a distance of 2 km. The home stay is equipped with free Wi-Fi to keep the guests connected with the world throughout their stay.